In Greek mythology, Mt. Olympus was the home to several gods and goddess. Rumors have it Olympus adopted the name as a constant reminder to create high quality devices good enough for any god or goddess to use. 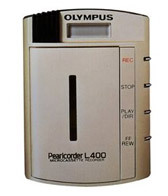 Founded in 1919, Olympus Corporation designed and introduced the world’s first microcassette recorder, the Pearlcorder S in 1969. Although a great start, the Pearlcorder S was later redesigned, re-launched and re-branded as the Olympus Pearlcorder SD in 1977. The Pearlcorder SD became the world first mass-produced microcassette recorder and revolutionized the way doctors, lawyers and journalists captured essential data. This particular model holds a very special place in my heart as it was the first voice recorder I ever had the pleasure of working with. Currently framed and displayed proudly in my office, it’s a constant reminder of how far the voice processing industry has advanced. In case you’re wondering, Yes, I also have the detachable AM radio receiver module. Olympus didn’t stop there and in 1982 created the world’s smallest and lightest weight microcassette recorder the world had ever seen, the Olympus L400 Pearlcorder. Among several other accolades, the L400 Pearlcorder became one of the longest produced recorders staying on the market until about 1994, which is around the time they teamed up with Grundig and Philips to establish the Internal Voice Association, which defined the Digital Speech Standard (DSS) file format still used today in their professional Digital Voice Recorders. In 2000 Olympus introduced the world’s first digital voice recorder with Smart Media, the DS-1. Fast forward to the present, we’re talking about a manufacturer with over 40 years of experience perfecting professional voice recording products with an impressive lineup today consisting of over 23 flavors of voice and audio digital recorders. Olympus voice and audio recorders are divided into several categories based on features, positioning and user scenes whether for private or business use. The first category we’ll address is the consumer series. 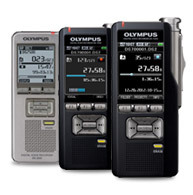 The Olympus consumer series is divided into several subcategories to cover a variety of basic voice recording needs. DP (Digital Pearlcorder) Models like the DP-201 are monaural and offer no computer integration capabilities. Recorders in the DP series are considered entry level and offer few features. VN (Voice Note) Models like the VN-7100 and VN-7200 are also monaural, have no PC integration and are simplistic, making them a great choice for students. A step-up, the VN-PC series, includes the VN-701PC and VN-702PC, are also monaural but offer PC integration via USB. WS (WMA/Slim and Stylish) Models like the WS-801, WS-802 and WS-803 are basic but stylish as they offer Stereo recording and can be connected directly to a PC or Mac due to its integrated USB connector, making them ideal for recording meetings. Models like the WS-803 offer fun features like Voice Changer and FM Radio receiver. Next, we have the DM (Digital & Music) Models, which are separated into Standard Series and High Series. Standard Series models like the DM-620 offer Stereo recording, are PC compatible and considered to be a highly reliable standard recorder for amateur enthusiasts. High Series models, like the DM-2 and DM-4 are stereo recorders offering multi-content players with excellent quality and color LCD. As a musician and music enthusiast, The LS-PCM (Linear Stereo – Pulse Code Modulation) category is one of my favorite. There are 5 models in this category as the LS series includes the highest grade consumer models and the flagships for Linear PCM recording. All models in the category (LS-10S, LS-12, LS-14, LS-20M and LS-100) offer extra-high quality linear PCM recording and has a quantization bit rate of up to 24bits, which in laymen’s terms simply means the record quality is better than you would find on a CD. As these devices were designed to capture live music and audio, they have a tripod hole, offer multiple recording formats, have a high quality speaker and come with removable media options. Olympus manufactured several accessories to accompany these superior devices like windjammers, remote control, clip stands and mini-tripod stands. On top of the Olympus digital recording food chain is the DS (Digital Speech) Series. The DS Series includes 3 models, the DS-2500, DS-3500 and DS-7000 digital voice recorders. The DS-2500 is the entry level model and is a great fit for casual users needing high quality recording capabilities. 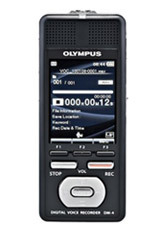 Using push-button operation, the Olympus DS-2500 records in the DSS Format, has conference and dictation recording settings, multiple recording modes and a large black-lit LCD screen. Although a great device, the DS-2500 lacks several features professional users require such as: device security, encryption, professional editing and proofing, slide switch operation, recharge-ability, docking station, data management software, DS2 file format, Keyword Entry, Barcode Scanning and more. That’s where the Olympus DS-3500 & DS-7000 devices come in. Designed for professional dictation, they are ideal for small to large sized organizations and are by far the best digital voice recorders Olympus has to offer. Even fully loaded, the DS-3500 & DS-7000’s are easy to use. For static users, Olympus offers a line of USB microphones called DirectRecs. 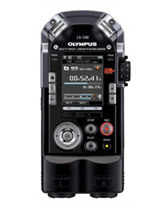 The Olympus DirectRecs are handheld, programmable microphones designed for single-handed operation and control. Like the digital voice and audio recorders, the DirectRec microphones have a few models to choose from, the DR-1200, DR-2200 and DR-2300. 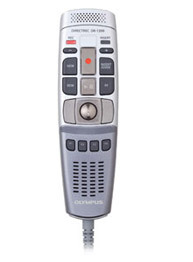 The Olympus DirectRec microphones offer several buttons that can be programmed to work with your favorite applications like Dragon Medical Practice Edition or Dragon NaturallySpeaking. Trackball and mouse buttons allow users to complete a number of tasks without having to go back and forth between your microphone and mouse. Stylish in design, these USB devices include a low-noise directional microphone that filters ambient background noises. These devices are compatible with PC & Mac computers, and provide users with the utmost flexibility and control. A Device Configuration Manager application is available to provide easy customization and insures complete integration for speech recognition. The DR-1200 is a push button model, while the DR-2200 offers slide switch operation. The DR-2300 is ideal for those professionals needing barcode scanning capabilities. For advanced device customization, an SDK (Software Developers Kits) is available to insure compatibility with a number of applications. 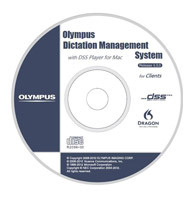 In addition to the Olympus Dictation Management System software packaged with the professional voice recorders and transcription kits, Olympus offers a few other tools for busy professionals like the License Manager, System Configuration Program and Device Customization Program. The Olympus License Manager, commonly referred to as LM is available as part of the Olympus Administration Kit and is used to manage licensing and registration of the ODMS software. The LM allows network professionals to manage accounts, track availability and check status in a workgroup configuration setting. The System Configuration Program, commonly referred to as SCP is the piece that allows managing of user settings, software management, device firmware management, provides the ability to create new users and groups as well as manage the repository location. Essentially, the SCP is the system administration application used by system administrators for software management and to facilitate the deployment of new software and firmware updates. The Device Customization Program (DCP) is an application used to customize recorder configuration by programming the device features and functionalities in addition to providing selective locking features to protect device settings. The three of these administrative applications can be used to provide another layer of customization for the authors and typists using the professional data management system. We’ve reviewed a lot of products here with the goal of providing you with an in-depth overview of the available voice processing hardware and software offered by Olympus Corporation. We could go on for a while as we didn’t even touch on the transcription devices, analog products or the long list of available accessories. The staff of Certified eSupport is well versed in all of the software and hardware devices offered by Olympus Corporation. We know the products better than anyone and have decades of experience working with these solutions and customizing them to fit the individual needs of our clients. Let us be your partner. We offer affordable, annual support & maintenance packages to ensure you get the help you need. Contacts us today to learn more about how we can help you improve financial performance, raise the quality of care and increase customer satisfaction.